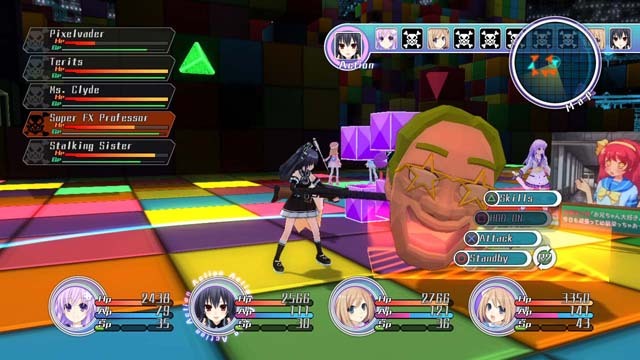 Hyperdimension Neptunia, the game about the gaming industry. The first had a great concept, but had a fundamental flaw in the battle system (healing was terrible). Will the sequel improve the game, elevating it to the highest of RPGs? Thanks to NIS, we will now find out. The characters and locations are done in the anime style, so if you like that (as I do), you will like the graphics. Most cut-scenes use the 3D model of the characters instead of the HD sprite version. I'd prefer the sprite version, but the 3D models look good enough that it's not really a problem. Many times during cut-scenes characters that are talking don't always appear as one of the two characters that are animated on-screen. It's a strange choice more than an annoyance, but I did notice it. One thing that surprised me: most enemies I haven't seen in another game except the returning ones from the first. There was a period where most Compile Heart (if you didn't know who Compa was representing, now you know) games all had similar enemies, and I'm glad they included lots of new ones here. The dungeons can be a little sparse, though. Especially the plains and the abandoned factory just have areas to run around in, but not much detail or atmosphere to them. Some others are full of color and character. I personally like the Tetris-inspired one. A few of them remind me of Phantasy Star Online, and given the main character, I wonder if it's intentional. Also, occasionally when running around the dungeon, the frame rate seems low. It's not as though it drops or is choppy, it just doesn't look smooth. That's admittedly a minor complaint. Since I am reviewing the download version, it may not be an issue on the retail release. The English voices sound fine to me in this game. Compa, IF and the other returning characters have the same voice actors (even if some change pitch/tone), which is really nice when coming off a previous game. While many purists will change it to Japanese, the English VAs do a good job. The music is also decent, if forgettable. Unfortunately, I haven't run across my favorite track from the first game, which was used in the tutorial dungeon. It will be hard for me to talk about how this game plays without comparing it to the first one, so bear with me. Last time, it was old school party vs. monsters, turn based combat. 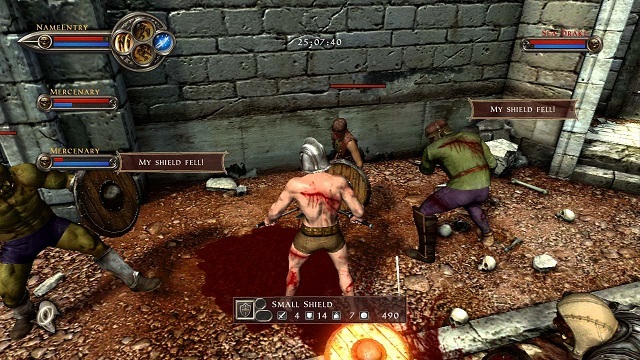 This time there is movement in combat, allowing good placement and strategy to help kill multiple monsters or beat a strong foe. If you've played Arc the Lad: Twilight of the Spirits, it's kinda like that. A thing that bothered me was enemy attack ranges. They seemed to have much bigger attack range and area (these aren't displayed for enemies) than anyone in my party. They also had lots of turns in a row, making them pretty fast. While they usually couldn't get in as many attacks as my characters could, it rarely felt like I had an advantage. How about actually attacking? Each attack takes a certain amount of AP, and the attack chains are chosen by the player and can be customized slightly in the menu. You also build up SP which, allows special attacks, healing, and transforming into the CPU form. This is gained from actually attacking, while AP is given each turn. It's a lot of numbers to keep track of, but as I say, the more numbers you give an RPG player, the happier they'll be (probably). Combat is fun and I like making my own combos even though I usually stick to the special "EX" ones for the extra damage. If my explanation wasn't good enough, here's some pictures to help out. Now for the real test...can you heal outside of battle, or even control it in battle? YES! Thankfully, you can use items to heal in and out of battle. While it takes certain amounts of AP to use an item, it's miles beyond the system from the previous game, which is why my wife and I didn't finish it. Compa (and others in a limited capacity) can heal people, making battles less tense. Honestly, the change to healing alone is enough for me to recommend this game to anyone disappointed in the first. 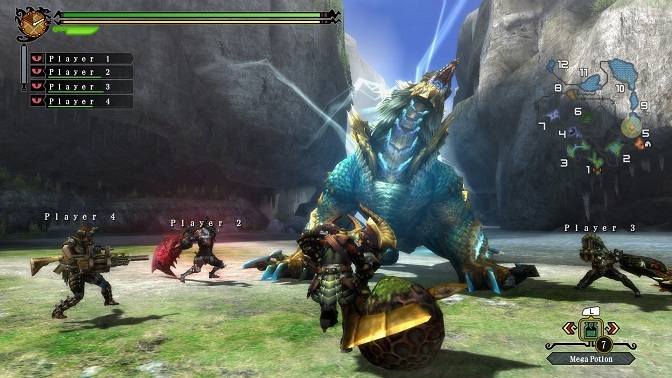 The main game can run about 35+ hours for a first run. Dungeons aren't very big and can be run through rather quickly. This is good for playing quickly, but not as engrossing as lots of other RPGs. There are multiple endings, but thankfully "New Game +" saves the day here. Keeping all your stats allows you to run through the game multiple times fairly quickly if you want to get all the endings. So even if you consider the first run a little short, there's replay value with the multiple endings. Admittedly, I don't always have time to play through an RPG multiple times, but New Game + makes that less of an issue when I'm ready to jump back in. The plot of this game, while not serious, is very funny to me. Last time, it was a parody of the console wars and their fight against piracy (the enemies are called Arfoire). This time, it's up to the handhelds to band together and again combat piracy. One thing I love doing in each new dungeon is see what new enemies there are and what they were "inspired" by. For example, there's a suspicious green pipe, a doctor's polygon head, and groups of four blocks whose names are all anagrams of "Tetris". I really like parodies, and the ones in this game make me smile. What about DLC? There is a bunch on the Playstation Store, and some of it is free. Obviously, grab the free ones, since they tend to be new dungeons and battles and such. Most of the paid ones are costumes for the characters, which you can grab if you want to, but are ultimately skippable. Before you buy, I'd check for pictures of them so you know what it is you are buying, since there is no picture, just a description. The last two pieces of DLC (and maybe the best) are the added characters. I'm hoping to get them soon, since they aren't too expensive ($3 each) and you get new characters to use in battle. Personally I want Cave since I really like their side-scrolling shooters. I'd also want to add on her death smile costume, because I like that game. The Trophies this time aren't that bad. The most tedious would be getting all the different CG Images (most are automatic) and all the endings. There's not really any that you would have to plan out your entire playthrough, and New Game + makes getting all the endings and any missables relatively painless. One last, and (to me) massively cool thing. You can download a template to make your own skin for Nepgear in her CPU form! Way better than making your own summon from the first game, this is a great addition that I wish more games could use. If you don't want to take the time to make your own, there are many to download that others have made. Be warned that some are NSFW (or NSF children, either). Thankfully, the really good ones are also tasteful. Even though I was doing a bit of grinding after each plot point before the next, I was having fun doing it. The battle system is more fun than the first, and that really improves the experience. 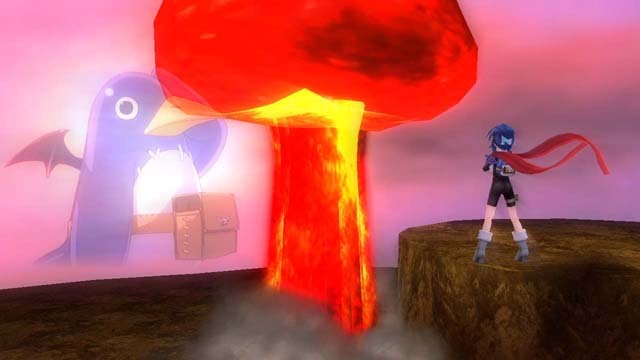 One warning though: they don't really cover what happened in the first game, so you will have to research it or piece it together if you haven't played the first Hyperdimension Neptunia. Nonetheless, I like this one over the first by a good margin. If you like JRPGs, check it out to (re)live the imaginary wars the handheld consoles went through to battle piracy. If you can't track down a disk copy, you can now buy it from PSN directly. If you plan to take your time and get a few endings, it's worth the asking price. After playing this, I'm looking forward to Hyperdimension Neptunia Victory even more.